Ask anyone what single object they associate with China and the most common answer will be a Ming vase. Probably without even knowing the dates of the Ming dynasty (1368-1644), people are aware of the fragility of its porcelain, its rarity and value. But porcelain is just one part of the story of one of the most glorious epoques of Chinas past. 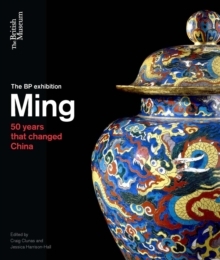 By focusing on the significant years of the early Ming dynasty and through the themes of court people and their lives, extraordinary developments in culture, the military, religion, diplomacy and trade, this magnificent book brings the wider history of this fascinating period to colourful life. This was an age of great voyages of exploration, undertaken for many reasons including trade and diplomacy. Long before the regular arrivals of Europeans in China, court-sponsored expeditions were sent to Asia, the Middle East and the African coast, bringing back knowledge of and objects from lands thousands of miles away gold, gems and foreign fashions. This period also saw the compilation of the worlds first comprehensive encyclopaedia (worked on by over 2000 scholars); the undertaking of major building projects such as the Forbidden City and Ming tombs; the creation of beautiful textiles, paintings, ceramics, gold, jewellery, furniture, jade and lacquer. The engaging narrative is richly illustrated with over 250 images, drawing on the objects specially selected for the British Museums major exhibition. Some of these are the finest pieces ever made in China.